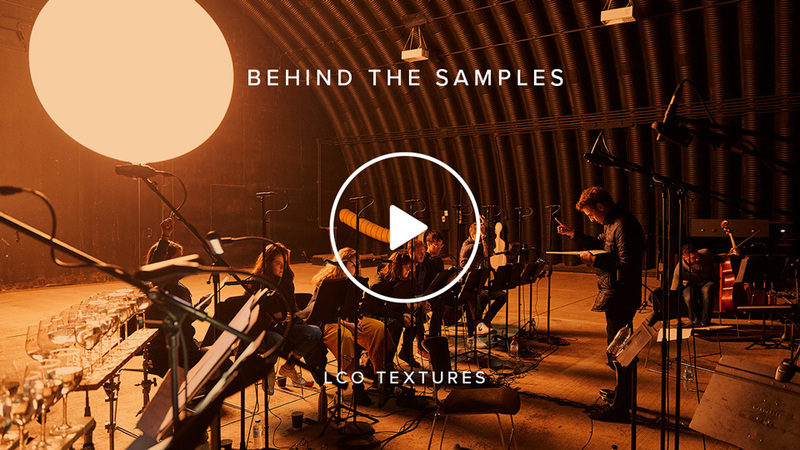 Our second collaborative venture with the internationally-acclaimed London Contemporary Orchestra took us to an awe-inspiring aircraft hangar for a recording process like no other. 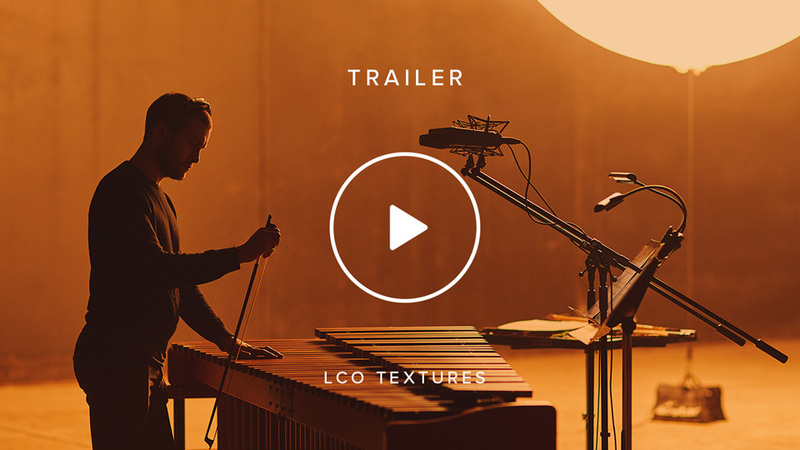 Together we have created a completely unique, never-before-sampled sound palette — a sophisticated collection of constantly evolving organic textures, formed by layering unexpected combinations of instruments. 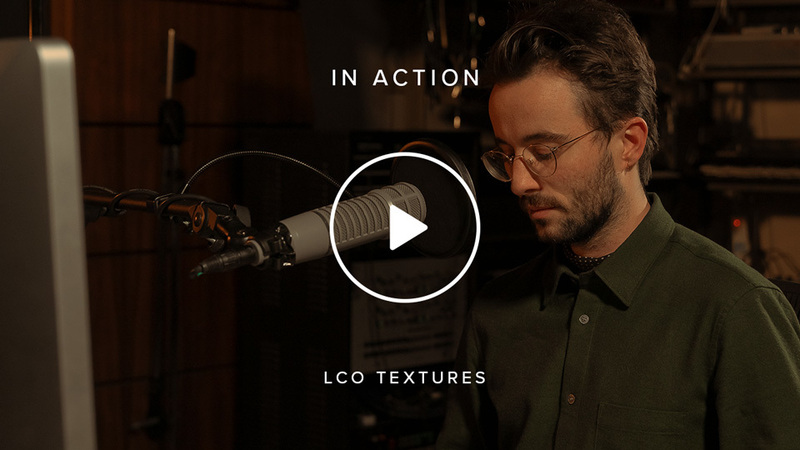 In applying the signature workshopping, performance styles and innovative techniques that have made the LCO so sought after, we have produced textures made up of indefinable, fascinating sounds. Our need for unparalleled acoustics led us to the most unconventional recording space in Spitfire’s eleven year sampling history — a cavernous hangar with a remarkably long reverb tail — adding incredible resonance to each note. Enhanced with our unique Evo Grid, we give you access to a cutting edge, inspiring collection of instantly playable, spellbinding textures which will add incredible depth and colour to your composition. 14.3 GB download size Too large to download? Choose hard drive delivery at checkout. Following the continued popularity of London Contemporary Orchestra Strings, our next collaboration with the LCO had to be something even more extraordinary. Our collective ambition was to achieve something that no one in the sampling world had done before — partly inspired by the orchestra’s recent studio collaborations, including Suspiria with Thom Yorke, The Innocents with Carly Paradis, American Animals with Anne Nikitin and You Were Never Really Here with Jonny Greenwood. We took familiar, pre-existing organic instruments and combined them in unique ways to create indefinable, expressive and modern sounds and textures — much like an artist using an array of disparate colours to create a new, multi-tonal palette — marrying together the LCO’s world class performers and ten years of experience in contemporary classical music and the film world, and Spitfire’s sampling expertise and pioneering Evo Grid technology. Through the power of sampling, we have created new instruments you would never be able to recreate outside a sampler — making the impossible possible. From conception to recording, the process was curated and orchestrated in intricate detail. In selecting the instrumentation for each group of textures, we focused on the idea that every musical sound can be broken down into three distinct areas — the hit at the front, the sustain in the middle, and the decay or release at the end. We then chose a select instrument or ensemble to inhabit each one of these areas, blended together and lengthened by the resonance of the vast space. We managed to retain the intimacy and expression of each sound by keeping the ensemble small and only recording up to five combinations of sounds at a time. We split these combinations of instruments into four groups — Ethereal, Mercurial, Quantum and Astral — named according to the soundscapes evoked by each bespoke combination. Each are distinct in orchestration, techniques and evolutionary style, but are also designed to complement each other when layered together. 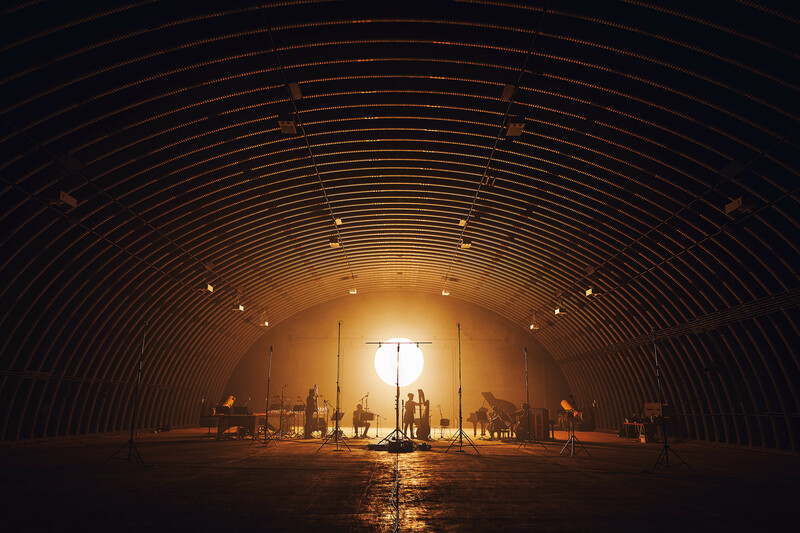 To achieve this stunning, spacious sound, we needed to find a uniquely vast space, which led us to Old Jet, a decommissioned aircraft hangar in Suffolk, England. 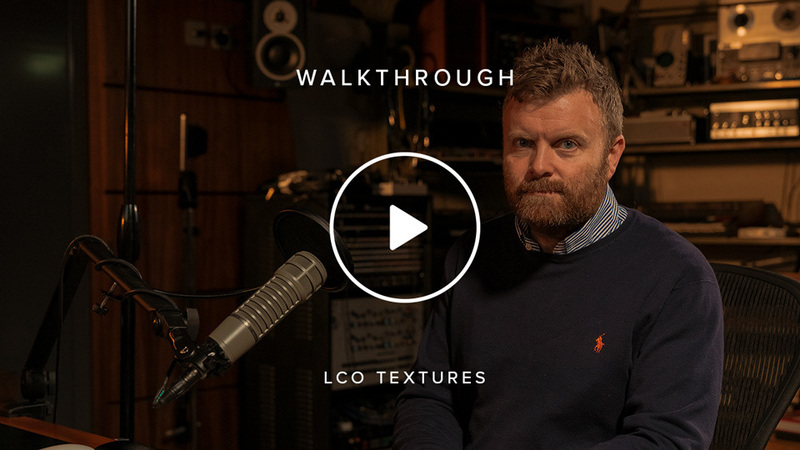 Originally built to test American fighter planes, its soundproof quality and 10 second reverb tail made it the perfect setting to blend and bring to life these multifaceted, otherworldly textures. Expertly recorded by the Spitfire team, led by producer Harry Wilson, we were in close collaboration with the LCO every step of the way. In such an extraordinary live space, the recording process required much attention to detail, as the smallest sound could disturb a recording in what is meant to be a controlled environment. 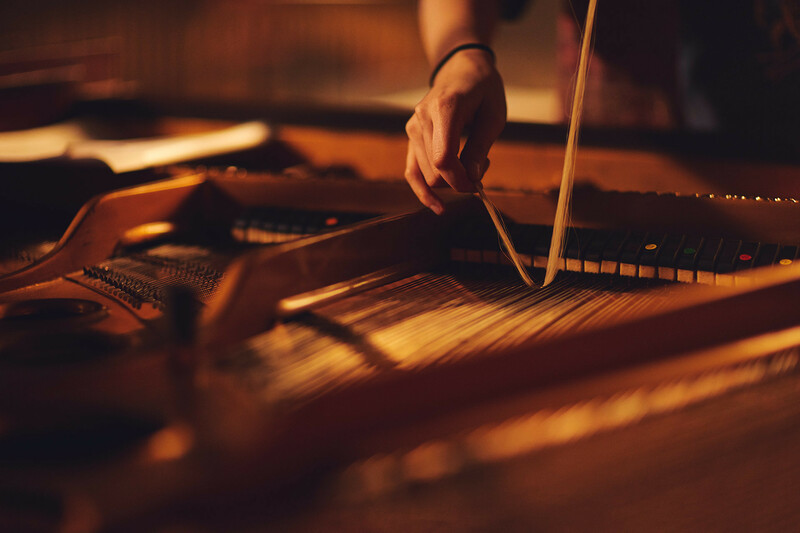 This experimental approach allowed us to take the sounds to a completely new place, using unconventional techniques, such as introducing vibrating foreign objects to the instruments, experimenting with quarter tone variants, adding fifths and extra octaves, introducing a variety of bowed textures — bowed harp, bowed marimba, bow hairs threaded through piano strings, and using different parts of singers' voices to create raspy tones. 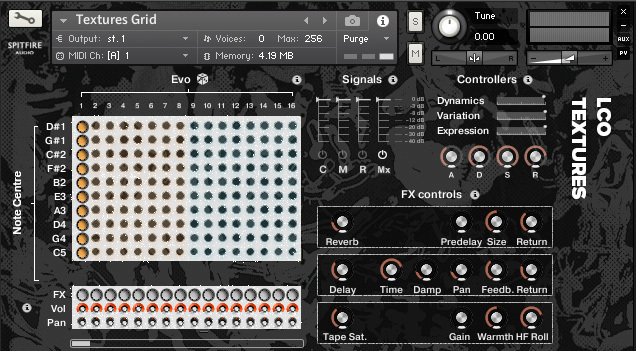 Our recording expertise and acclaimed Evo Grid technology adds extra dimensions to each sample, offering you a distinctive, ever-changing kaleidoscope of progressive techniques, with instant playability. 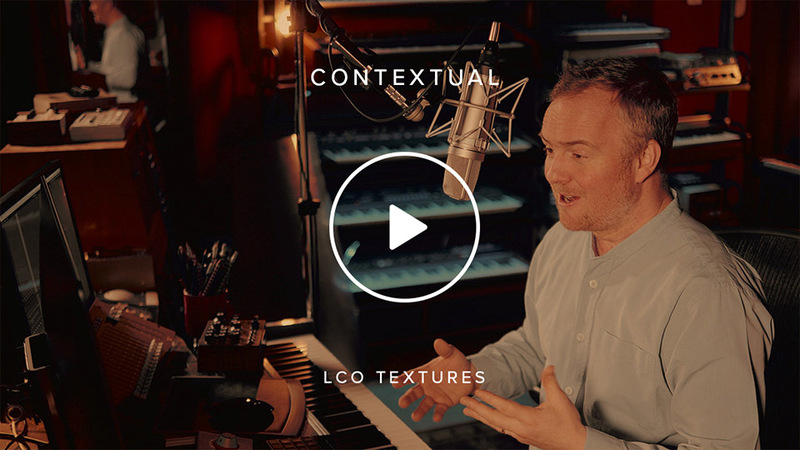 Choose between a range of mic positions for extra control — Close, Tree, Ambient and Outrigger, Room or add plate reverb or stretch the samples on each individual texture. The close mics give you much closer attention to detail, while still giving a sense of the expanse and warmth of the room. Every sound has been mixed by renowned mix engineer Joe Rubel (Sherlock with Michael Price, Floating Points, Ed Sheeran), with an option to choose his definitive mix (just select ‘The Mix’). Our bespoke, sophisticated Evo Grid UI positions ‘pins’ via an onscreen 10 x 32 grid arrangement, giving you access to recordings across 12 intervals. Instantly select which Evo (evolution) sits on each of those 12 key ranges, or generate randomised evolutions. Enjoy instant gratification with these engaging and inspiring long articulations that change over time, organised in a grid with infinite possible combinations. For the newly initiated, Evolutions are hyper-long articulations that change sometimes subtly and sometimes radically over time before looping, giving you unexpected results. Evolutions have become widely adopted amongst the composer community as the most effective means of easily writing music that is able to subtly change over time without variation in melodic content. These textures can be developed, shaped and processed further, offering you a rich range of possibilities. Blended to create unique, organic sounds, Textures can be applied to a wide range of compositions to take you to the forefront of modern music-making — from left-field electronic music to orchestral scores. With 32 expansive, evolving textures, and over 50 curated presets, giving you almost endless combinations of thousands of sounds, we offer you a new world of inspiration at your fingertips. “My hope for composers is that they get a taster of what it’s like to be with the LCO in the studio...a snapshot of the kind of creativity that happens between composers, orchestrators and musicians, distilled into a library"
Winner of the Ensemble category at the Royal Philharmonic Society Music Awards in 2015, the London Contemporary Orchestra has established itself as one of the world’s most innovative and respected ensembles, focused on commissioning and developing new music and scores, and performing live all over the world. Formed in 2008 by co-Artistic Directors and conductors Robert Ames (above left) and Hugh Brunt (above right), the LCO is at the top of their game, having collaborated with a wide array of musicians, creative figures and platforms, including Radiohead, Frank Ocean, Jed Kurzel, Steve Reich, Mica Levi, Actress, Arcade Fire, Foals, Nike, Secret Cinema, Boiler Room, NTS, Terry Riley, Hannah Perry and Vivienne Westwood. Highlights include sold-out performances at renowned venues such as Printworks, Tate Modern, Southbank Centre, There Will Be Blood: Live at the Barbican, the critically-acclaimed site-responsive series Imagined Occasions, and live broadcasts on BBC Radio 3. 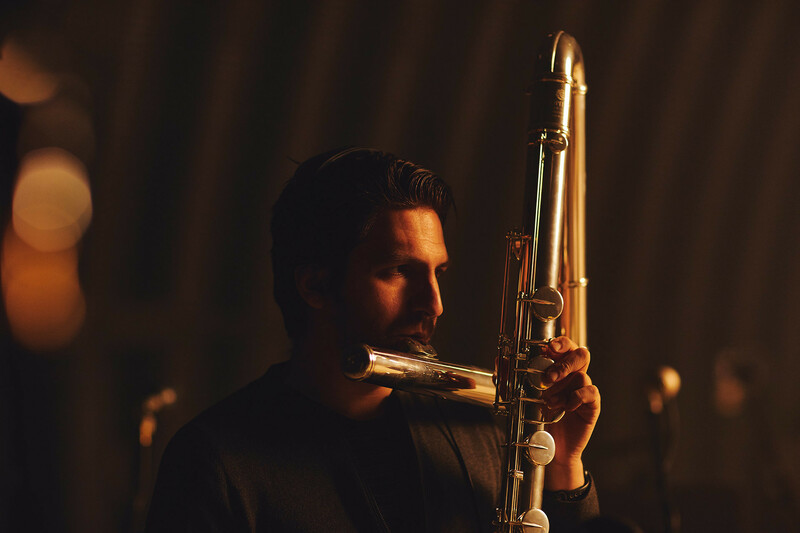 The orchestra has a strong arrangement, recording and performance record for world class film and television music, having recorded soundtracks such as The Master, Alien: Covenant, Macbeth, Phantom Thread, Assassins’ Creed, You Were Never Really Here, McMafia, Suspiria, American Animals, Moonlight, There Will Be Blood and Under the Skin, and featured heavily on Radiohead’s 2016 A Moon Shaped Pool.